Sometimes for Valentine’s Day, Hallmark just doesn’t cut it. If you’re looking for something a little more personal, maybe something handmade? Look no further than this post. This DIY that I whipped up is just another reason as to why I am so glad that I have a Cricut Maker in my life. Any occasion, any event or even if I just feel like crafting — this machine has me covered. Let’s take a look at this super cute Valentine’s Day gift I made with the help of my Cricut Maker, and EasyPress. Anytime I want to make something with my Cricut Maker, the first place I always go right to is Design Space. I came across this adorable scroll alternative to the traditional V-day card and thought that it was just too cute not to make. Let’s jump right into and I will show you just how easy this is to make. It took me less than 30 minutes to make this fun DIY. The cinnamon hearts and glass bottles are optional and something that I added at the end for a bit of extra fun! Place your Glitter Iron On your mat making sure that you place the shiny side (clear liner) down on the mat. Follow the prompts in Design Space® to cut the images from the iron-on material. I chose to add a little colour into my project, so I am cutting out the work “love” in pink glitter Iron On. Load your project in your Cricut Maker and then hit the flashing C! Once your project is done cutting it’s time to weed! 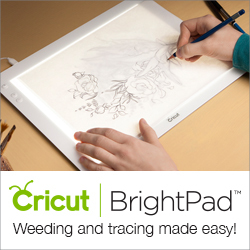 This is where a BrightPad comes in handy — especially for Glitter Iron On. It makes weeding so much easier. Once you have your project weeded, it’s time to press it onto your piece of canvas. I picked up this little piece of canvas from Dollarama. Cut out a piece of fabric/canvas that is long enough for the words that you cut with your Cricut Maker. ** There are a few things to make note of before using your EasyPress. This will help ensure a most perfect bond of Iron-On to your material. 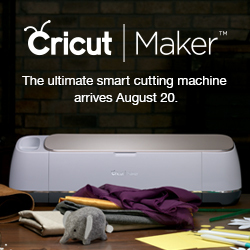 Follow this easy to use Quick Reference Guide that Cricut offers. All you do is input your material, base material, whether or not your using a Cricut EasyPress Mat and all your instructions pop right up! I suggest bookmarking the page so that you can always find it easily and quickly. The other thing to always make sure you do is prep your base material by heating it up with your EasyPress first, just for 5 seconds. Always make sure you follow the Quick Reference Guide but make sure you remember to press the back side of the base material as well after pressing the Iron On on the right side. This helps to really adhere the Iron On. I would never press without it.! Rough up the edging of the piece of canvas by running a Cricut Distresser down the edge. Now that you have your words press on, all you have to do is make the scroll. This is super easy. Using a bit of hot glue, glue the dowel to the end of your canvas piece. Roll up fabric around dowels from each end, meeting in the middle. Tie a pretty ribbon around it and you’re all done! Valentine’s Day is made easy with the help of Cricut!